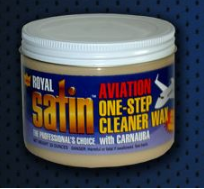 Garry's ROYAL SATIN AVIATION wax offers a unique blend of carnauba and cleaners that are specially formulated for aviation protection and cleaning. The blend removes surface oxidation and provides a high-gloss shine that looks great as your craft glides through the sky. It's also formulated to protect against sun, salt, chalking, and other related weathering effects. 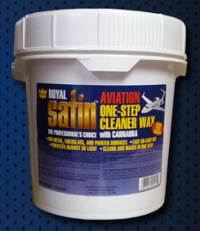 Garry’s ROYAL SATIN AVIATION offers a unique blend of carnauba and cleaners specially formulated to remove surface oxidation. It also provides a high-gloss shine that gives long-lasting protection against salt, sun, chalking and other related weathering effects. Count on our unique blend of carnauba wax and cleaners makes it easy to clean aircraft. The special formulation makes short work of surface oxidation while ensuring a high-gloss shine with lasting protection against salt, sun, chalking, and related weathering effects.